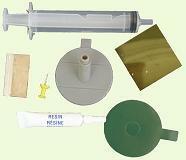 These are generally the items required to do repairs on most windshield stone damage. Included in this group of parts is a pushpin, adhesive strip, pedestal, specially made syringe, UV polymer rosin, curing strip, and a safety razor. There are alternate devices that will be covered as we go through the list of items and their use. You will also need a knife or scissors, drop cloths or towels, paper towels, and alcohol. The special made syringe has two purposes. It is used to evacuate air from the damage to allow the resin to flow more easily into the cracks and then to apply pressure on the resin to force it deeper into crack damage. The alternating vacuum and pressure cycle may be applied a couple of times on stubbornly trapped air, but usually one cycle clears the air from the crack. There are also syringe type injectors that have plastic clips instead of metal clips and have one or two notches. A few if the syringes used for windshield repair don't have notches or clips. Each different configuration is designed to be used slightly different to the others although the net result of their operation is to inject a polymer resin into the cracks in a windshield. We will look at some of these later in the course and explain their philosophy of operation. The special designed syringe has a spring clip to hold the plunger in place while waiting sufficient time for the vacuum and pressure cycles to allow the trapped air to escape the crack and to allow the resin time to flow into the crack under pressure. Along with the spring clip, there are notches in the syringe's plunger that are engaged into the spring to hold the vacuum on the crack or pressure on the resin during the repair. The upper and lower notches are used to lock the plunger into position either holding a vacuum or pressure on the repair while locked with the spring clip. 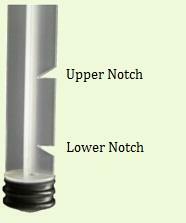 The lower notch being used to hold a vacuum and the upper notch being used to hold pressure within the injector.